KANSAS CITY, Kan.—Driving a No. 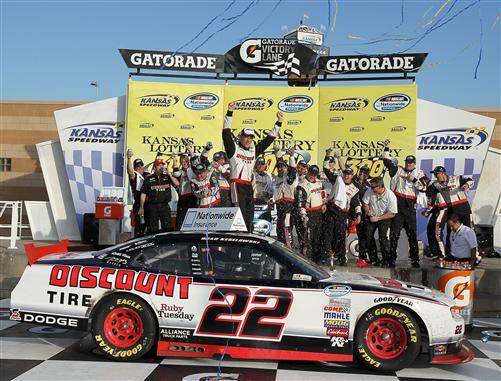 22 Dodge that felt as if it were on rails, Brad Keselowski dominated Saturday's Kansas Lottery 300 at Kansas Speedway to win his fourth Nationwide Series race of the year and the 16th of his career. The reigning series champion passed runner-up Carl Edwards with just over 13 laps left and pulled away to win by 2.795 seconds. Elliott Sadler ran third, followed by Paul Menard and Nationwide points leader Ricky Stenhouse Jr.
Chevrolet exploded on Lap 142. The No. 22 Dodge hit pit road for tires and fuel and quickly stretched out his lead. But when Angela Cope spun and hit the Turn 2 wall on Lap 173, Edwards was able to grab the lead to the inside after a restart on Lap 179. His advantage didn't last. Keselowski moved past Edwards to the inside on Lap 187 and pulled away for the win. From Keselowski's perspective, the winning pass was anything but a foregone conclusion. "The first few laps that I was behind him, I was pushing so bad in his air that I had some serious doubts," Keselowski said. "I go back to last week at Dover in the (Sprint) Cup car. In the last segment, we restarted 21st or something like that, drove through the lapped cars, and I ran down the lead pack from a straightaway behind in about four laps—I was three or four tenths (of a second) a lap faster. "Then I caught the back half of the field and slowed down three or fourth tenths of a second in the dirty air. I was thinking about that the whole time I was behind Carl there, and I was like, 'Oh, my God, this is going to be another one of those days.' But I was able to move my line around and find clean air." Keselowski may have had his doubts. Edwards—not so much. "Brad's car was so fast," Edwards said. "I knew after about 30 laps that, unless something happened, we were going to be racing pretty hard for second place. Fortunately, there at the end, I did get a chance to race with him a little bit." As it turned out, not for long. Keselowski was the clear class of the field in the first half of the race. On successive green-flag runs, he opened leads of seven, five and four seconds before cautions bunched the field. Keselowski led Sadler by 3.785 seconds when NASCAR called the fourth caution of the race on Lap 86 for Timmy Hill's blown engine. Keselowski, who had stayed out under the previous yellow, came to pit road for fuel and four tires on Lap 88 but stalled his car in his pit box because of a miscommunication between driver and crew on when to leave the stall. "My fault," Keselowski radioed after the mistake. "I wasn't ready when you dropped the jack." Keselowski restarted 14th on Lap 96. Six laps later, he was back in the lead, blowing past Aric Almirola for the top spot on Lap 101. Notes: Stenhouse leads Sadler by 20 points in the series standings with four races left in the season. … Reed Sorenson, driving the Randy MacDonald's No. 82 Dodge after his sudden ouster from the No. 32 Turner Motorsports Chevy earlier in the week, ran 26th, two laps down. He remains third in points but fell from 49 to 70 behind Stenhouse. … With his runner-up finish in the No. 60 Ford, Edwards trimmed the lead of the No. 18 Joe Gibbs Racing Toyota to seven points in the owners' standings. … Danica Patrick finished 15th, her best result since finishing 10th at Daytona in July.